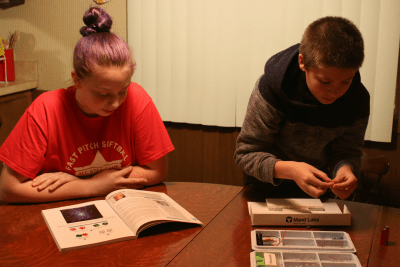 This is a guest post from STEM Kids Chicago contributor Brandie Langer. She was sent a kit for review. When the Mand Labs Electronics Kit first arrived at our house, I’ll be honest. I was a bit intimidated even though it’s an electronics kit for kids. My knowledge of electronics was approximately nothing. Even though I decided to review it because I thought would be a good fit for my 12-year-old son, I thought, what if he asks me for help? I’ll be clueless. In fact, I was so worried about it, I initially had my husband come and look at the box and go through the parts with us. Right from the moment we first “opened” it, I was impressed. I say “opened” because the box flips open and then drawers come out. A storage containers opens to reveal containers of items. Another storage spot opens to reveal some books. It felt like an infomercial with its “but wait! There’s more …” quality to it. My husband, who works with electronics and can do things like replace an outlet, connect two cords together to create a longer cord, and all sorts of things I’ve always chalked up to wizardry, was quite impressed too. He pulled out the multimeter in the kit and said, “this might be nicer than the one I currently own!” My 15-year old daughter was in the room and she walked over.”This looks interesting!” she proclaimed. So the three of them sat down and waded in. They flipped open the book and started to learn. The book starts with basics: what is electricity? Diagrams of atoms, pictures of lightning, how batteries work – it’s all there and it’s all understandable. They read through section 1, and tested the voltage of a battery with the multimeter. They started on section 2: resistors. I watched as they pulled some resistors out (included in the kit) and tested them with the multimeter. Everyone was learning and having fun. Section 3 had them playing with LEDs – again all included in the kit. Here’s where my 12-year old really lit up (oh, see what I did there?). He was so excited to make a blue LED light up being that blue is his favorite color. They pulled out the breadboard and played around a bit with making the LED’s light up. Then it was time to pack it all up as bedtime approached. We put everything back into its proper place, closed drawers, snapped snaps, flipped the box back together into a nice rectangular box – everything all together and easy to store in the cleverly designed kit. Not too long after, I noticed my husband had pulled out the two workbooks that came with the kit and was reading them. He paused for a minute and said “These books are really good! Even I’m learning a few things here and there from them!” I thought to myself these books must be really good if even he can glean something from them. But it also made me a bit intimidated, too. I mean, here’s my husband who already knows so much about electronics and wiring things together (mostly taught to him by his grandfather) and he’s learning things? Maybe this is just too good for me. But, I put my brave homeschooling mom face on and whipped the kit out myself. I called my son over so that we could do it together – hoping that between the two of us, we’d figured things out. I don’t want to brag, but I now know what a circuit is and the difference between an open circuit and a closed circuit. Okay, that might not seem like much to some people, but to me it’s huge! He played with it a bit longer by himself and picked up on how things worked pretty quickly. We haven’t yet delved into anything too complicated – we are working our way up, but I can honestly say the whole family is enjoying this kit very much. My son and daughter are focusing more on the actual doing of projects. Which is fine by me. I know that when they are physically doing, they are also absorbing the science as well. Some of science in the book is at a higher level than my son as well. We skipped the section on Ohm’s Law. Seeing that this kit is for high school-aged students, the science was above him. BUT, he is clearly still learning and benefiting from the kit. He is taking a lot of information in. And we have a lot of room to grow as we are ready to. All of that said, what I really love is that my son and I can now create closed circuits and make LED lights turn on and off at our will. I love that we can see on the breadboard how the circuit is made and how all the parts end up connecting to each other. I love that he thinks it’s so cool to turn on those blue lights. And I love that everything we need (literally down to the batteries) is included in this box. Now, if you have more knowledge than me, you’ll probably want to skip over most of the first workbook and jump straight into the second. The first few things in the book are quite basic – which is perfect for someone like me but would not be perfect for someone like my husband. If you get to the end of the workbook and are out of ideas, you can sign up for a weekly project to be e-mailed to you once a week on their website. Or you’ll just have to turn your creative cap on, and think of your own ideas! As I look at the kit – and see switches, and motors, and wires, and capacitors – I know we have a lot more things to create and make. Through all that fun, though, we’ll be learning. We’ve made it half-way through workbook 1, and there’s still a second workbook. I suppose at this point, the sky is the limit. You can purchase the Mand Labs Premiumm kit (reviewed above) or standard kit on Amazon (affiliate link). 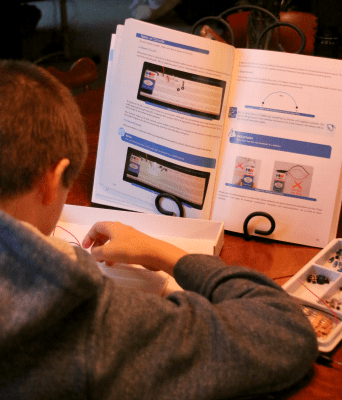 Other electronic kits for kids include Snap Circuits, Circuit Stickers, and littleBits, all of which are Maker Mom favorites and are ideal for younger audiences.